But with spring coming (and I don’t know about where you live, but we’re getting a very early sneak preview where I live!) it’s time to check your baby boy’s wardrobe and make sure you’ve got his clothes organized for a day at the park, the zoo, or the playground. I was thinking of shortalls today because I just ordered some from the incomparable Ms. Loraine on eBay. 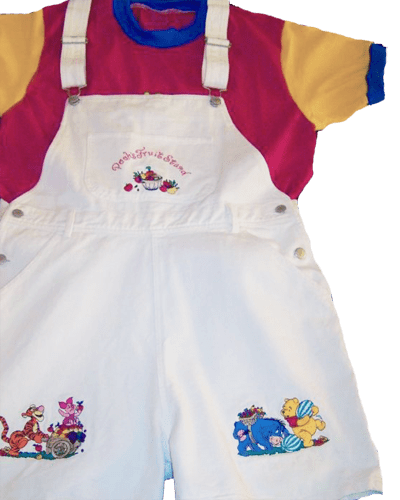 And while I suppose you could dress a little guy in these adorable Pooh shortalls in the winter – they really deserve to be saved for the first trip to the park once the warmer weather comes. As a Daddy to an adult baby, snaps might seem like something that’s simply practical. With your little guy dressed in his shortalls, diaper checks and changes can be a real hassle if there are no snaps along the legs. Snaps let you check your little guy without a lot of fuss. And if he needs a change, you can lie him down on the crinkly change mat and put him into a clean diaper without needing to undress him or worry about the shoulder straps. But for the adult baby or little boy, snaps provide a different kind of assurance. The slight ‘click’ they make as Daddy does up the snaps on his onesie or along the legs of his sleeper are subtle reminders that he’s a baby boy who needs his diapers. Snaps remind him that Daddy needs to check him and change him. Snaps are a reminder that even though he’s just been put into a nice clean crinkly diaper, it won’t be long when Daddy will need to slip a finger along the leg of his diaper to see if he’s wet. And, I can’t help thinking, there’s something reassuring and ‘safe’ about snaps. Or at least it makes me feel that a little guy is secure – which is maybe why I like shortalls so much – with the shoulder snaps, it’s like a double layer of protection! What Are Your Favorite Outfits with Snaps? What about you? Are snaps something that you know Daddy likes because they’re practical? Or is there something about them that make you feel safe and snug? And do you have a favorite outfit or item of clothing with snaps? Send along a photo if you like, and I’ll add it to the gallery below! And in the meantime – get a snap on it – spring is coming! Well daddy like to put me in a fleece onesie this time of year with pooh or micky on it then put me in my shortalls and yes i love the fact that i am in my thick diapers and baby cloths out playing and it is a special treat when daddy lays me down to unsnap every thing to give me a diaper change. Shucks! my shortalls don’t have a snap crotch and I have to stand to be changed. Weather permitting, babies and todlers should be allowed to wear only a diaper and tee shirt. That would be cool!! Stevie transitoperator@msn.com!! thanks for another great insight! I’d love Daddy to put me in 1 of these. They look so cute. Would you put me in 1? 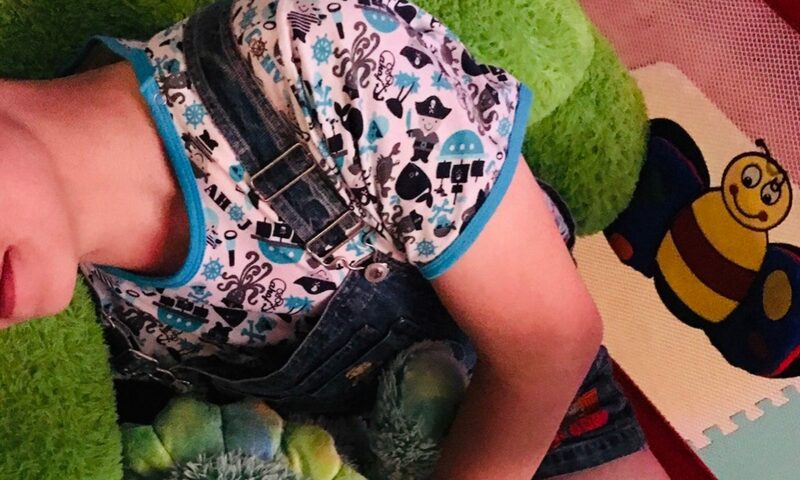 Daddy, what a lovely article and you are so right there is something reassuring about hearing the snap that secures the onsie, sleeper, shortall or overall. With thick secure diapers and the knowledge that daddy can check and change as he desires a little guy is set to play, snuggle or nap. However, I do admire daddy for bringing his baby boy to the park in white shoralls, giggle, I know that between grass stains and the swing daddy will have his work cut out for him at laundry time! I love snap pants and shorts. Snap shorts is all I wear all summer long. Most of my friends think its adorable. But they all know I am just a big toddler. Great Article Daddy. Actually for me its the time for repairing snaps because I have one of my baby blue onesies (ni ni time only) and one of its snaps came off and I need to see where to get those and how do do it. I will probably retire those and my white ones for daily T- Shirt use sometime in the fall. Wish they lasted forever but they do wear out after a while. Scary part is I do not know where to get them now. I also would love to be able to get some nice Navy Blue Onesies. I have three of the light Yellow ones but they never have quite fit right like my blue and white ones. The Shortalls sound like fun but I cannot see wearing them around town here so jeans are much easier. Happy Spring Break from Everyone. My Nursery school (school district) is off next week so I get the week off from Nursery School to stay home. 🙂 I hope the weather will stay nice here in Colorado. Why are you always talking about “little” boys? There are “little” girls too :(. I’m a “little” girl. this post was a super fun surprise! i just snapped up my fweess onsie before reading the posting. snap! snap! it make nice loud snapping sounds that remind me that me’s all snugged up. i love my ah_sh_K#osh blue shortalls even if dem don’t have snaps cause my onsie does it is inside! bear and me thank daddy for the story and happy spring! my favrites are my side snap plastic pants. After Daddy pins on my cloth dipes he slides the plastic pants under me and starts to snap up each side. He says “snapee” with each one and we giggle. I know when there all snapeed up I can go out to play and be nice and dry. I came to your site, the first one I discovered and I was drawn to it and there was an awakening. That was April 2012. I exchanged some communications with two different AB guys, being their caretaker role for them. I have since been continuing to allow what is suppose to happen to happen and I have never been this happy. I want to thank you. You make a magic that allows us to become what we should be. I am becoming, and it’s hard to write this for me, emotionally, this is the first time time to say it. I am freeing my inner child and I can’t feel where I will be taken, but I feel so peaceful and happy. Thank you and wish upon a star for me that happy endings will be around the riverbend. Like shortalls,very cute,with thick pampers/ cushies underneath!! I need a daddy in Utah CAN anyone help me,toddler Wally find a Daddy? The picture in this post makes me think of how I look in my oshkosh overalls, except mine are long leg. If my tshirt bunches up or sometime the top snap pops open then my plastic pants show. A few weeks ago we went to a house sale where they were moving and selling furniture and clothes and stuff. I saw this cool bed that looked like a racing car, with wheels and everything. It was in a kids bedroom with racks and tables of toys and clothes too. The lady selling stuff asked Daddy if I was about ten and he said yea. Most people think that cause I’m very short and thin and have longish strait brown hair. I was bending down by the bed and I think she saw my plastic pants cause then she showed my Daddy a bunch of trainer pants and kids pjs and even some unopened packs of goodnites, the old kind that were all white and kinda thicker. She said we could have those for free if we bought the bed. There were ninja turtle pjs and toy story pjs and some footy sleepers too. The trainer pants were light blue plastic with thick cloth inside. She said her son is now in college and she sure was glad someone who loved the bed and could use his old special nitetime clothes came by today. I love my new bed it is so cool and I get to use the clothes too but mostly for daytime cause nitetime is extra thick diapers. I am an 18 year old college boy who found a Daddy who diapers me 24/7. He dresses me in corduroy shortalls and overalls with the snap crotch and a nice thick diaper. You forgot one thing that I like best about shortalls, at least some of dem. For fashion reasons, they often have a fake fly, that’s so much fun. I might look like a big boy, but if I tried to use the fly, I couldn’t do it and I’d wet my diaper. And then the snaps are needed. It all says, “these are for little boys in diapers”, sooo much! I love knowing that daddy doesn’t expect me to get out of diapers any time soon.